Standard, round, unlined metal paint cans with friction fit lids. These are uniformly through-hardened to 62-65 Rockwell C and have excellent wearing qualities. Made of chrome steel alloy. Designed for bench-top use. Easily moved to any location. 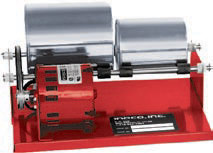 These versatile roller mills are ideal for blending and milling small batches of pigment, paint, ink, adhesives, etc. Can be used with any standard size cans for blending dry powders or with the grinding media listed below for milling pigments or liquid composites. 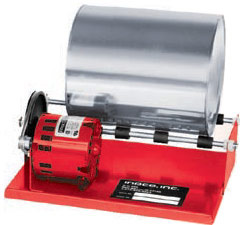 Equipped with heavy, continuous duty, 1/75 HP, fan-cooled motors with overload protection. All models come with cord for 115 volts, ready to use. Grinding media and cans not included.